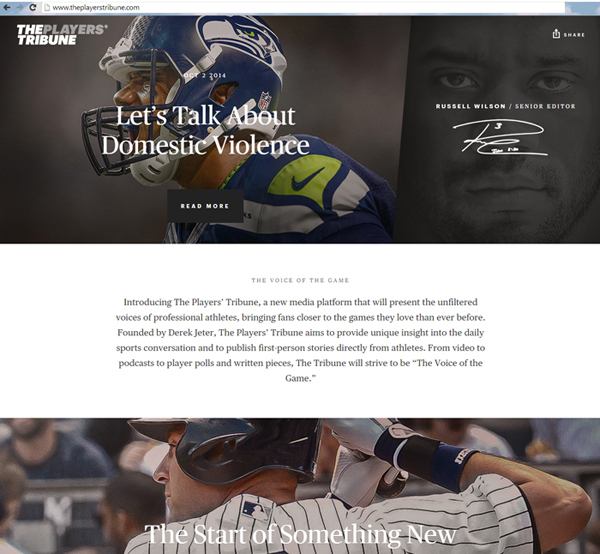 PlayersTribune.com launched yesterday with a single story on domestic violence, signaling the site’s gravitas. Derek Jeter’s launch yesterday of The Players’ Tribune is intriguing. Newsmaker as publisher. Athlete as brand. The business opportunity is tremendous. The venture, his second media business play*, is a website comprised of sports news, features and commentary from pro athletes. It’s meant to allow the fans to hear directly from the players, avoid the middleman of traditional media. There will be no banner advertising, and revenue is projected to come from content marketing projects underwritten by sponsors. Here’s how The Players’ Tribune stands to disrupt the sports economy. Sports news is a commodity: There are so many sources for news and information that the traditional stalwarts (newspapers both in print and online; magazines) are fighting to stay relevant. The digital-only plays are focused on data (scores, statistics), features and commentary. The winners are the TV rights holders because fans tune in live and watch highlights. So if you don’t have video rights, you are starving for stories to set you apart from the competition, such as The New York Post versus The New York Daily News versus The New York Times, etc. What separates those publications are the scoops they get and their commentary. But The Players’ Tribune is built for those: Why would an athlete divulge something to a reporter when he or she can break it on the website they can profit from? Access: The best reporters are the ones who build relationships over time and are trusted by players, coaches, agents, etc. They get access that others don’t get, such as the one-on-one interview, email contacts, invitations to exclusive gatherings. Whatever access they’ve earned is belittled by the access that editors of The Players’ Tribune own. Conflict of Interest: Journalists are supposed to be objective parties who weigh elements of a story and contextualize it, in a fair and balanced way, for the audience. Jeter says players have been burned by the media so they’re taking things into their own hands. The risk here is that The Players’ Tribune could be a PR organ for athletes. The leadership team promises it won’t be a marketing website for the players, but how will The Player’s Tribune cover one its own being investigated for doping? The execution will be key, and we’ll see if fans care about the inherent conflict of interest. When those you serve become competition: The Internet made everyone a publisher. What’s happening here with the covered athletes becoming the publishers is exactly what happened in the late 1990s as digital media was catching on. Example: I launched TENNIS.com in 1995 for TENNIS Magazine, which was then owned by The New York Times Co., and stakeholders in the game sought our coverage. I had a generous editorial budget and we provided original daily coverage of two pro tournaments per week (domestic and abroad) and produced original content for fans and players. The stakeholders in the game — the tours, the governing bodies, the tournaments — pursued our coverage. Then, a few years later (after I convinced the USTA to trust digital and introduced them to IMG’s interactive development group), these stakeholders built out enormous, beautiful websites. Over time they partnered with IBM and sunk tons of money into their websites and became our competition for audience. We could not compete with the access. They no longer sought our coverage and instead hired their own writers and producers, which they still do today (along with social media staff). This is history repeating itself. Sports media has been trumped. Athletes have handlers — the managers who represent their business interests for maximum value. They negotiate deals (endorsements, appearances, etc.) and handle the money. A large part of their work involves finding sponsors. If Auto Company “A” can sponsor a content series of power and elegance on and off the court/road, they stand to make a more efficient buy than going through an agent. And, they’ll likely get more value and engagement for each dollar spent when they deal with a website with enthusiastic fans — who registered and provided details like postal address, cell phone, email, and more — than they would for a deal that doesn’t have a firm distribution platform in place. The agent has been trumped. These agencies sit between the corporate client and the media outlet. They negotiate terms and craft the creative campaign using the athlete. 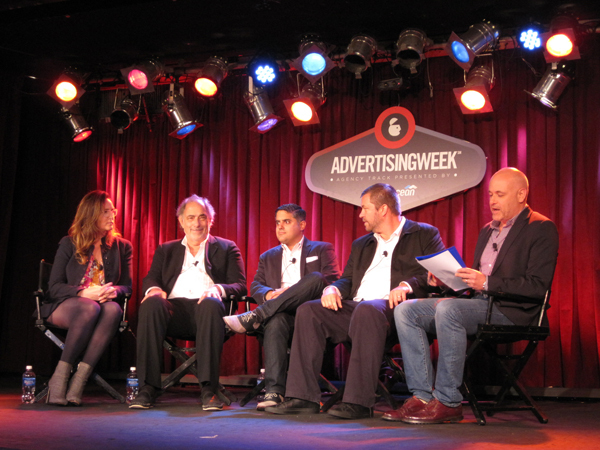 The traditional process works: Media pitches client and agency does the work. There are variations, but this has been the traditional operating procedure — until recently. The Players’ Tribune is building agency-like capabilities: It can cut out both media and agencies. There’s more money to be made when there are no service providers to pay and you own the relationship with your audience. The not-for-profit organizations running pro sports — MLB, NFL, NHL, etc. — have gone to great pains and expense to build digital media platforms that provide equal weight to their franchises. MLB would have a tough time selling TV rights and tickets if the digital experience across teams was tied to each team’s financial health. The value of league branding is greater than the sum of its individual teams, goes the wisdom. A vital aspect of this is aggregating the largest online audience to garner the highest TV rights fees and to have distribution across platforms to charge sponsors. The leagues and pro tours count the players among their assets. And those assets are for sale. Sponsorship takes many forms, from naming rights on stadiums to patches on uniforms. Imagine how much a company can save — and the value it can get — from aligning with a single player rather than an entire team? Imagine the type of involvement that player can provide in the creative process to personalize the campaign? What we have here is a new sort of player’s union. Yes, the pro athletes have unionized to form a media company. They control the content, the revenue generation and, ultimately, the audience. Sounds like a winning combination for The Player’s Tribune. The leagues have been trumped. If The Players’ Tribune can manage to pull off the vision of a digital sports media property with rich content and a great experience for fans and sponsors, it will be a new model. Could it expand to other professional groups, such as actors, musicians or politicians? If The Players’ Tribune can amass the scale of audience, it will be a triumph. The large media companies are able to segment their digital audiences based on interest (baseball, football, etc. ), but much of what they sell is general impressions. So how long will it take for this venture to build scale? Nobody knows. But they’re not selling impressions of display ads; they are selling specialty content plays. That is more of a niche market. And it’s a smart tactic. How will the sports industry respond? To be determined. Bob Bowman, the president of MLB Advanced Media who was featured in a session today at Advertising Week, said “I tip my hat” to Jeter and company. His view is that whatever grows audience interest in the players, the teams, the league, and the sport is a great thing. The end result, he hopes, is increased consumption of baseball through ticket sales, television ratings and digital viewership. I like challenging the paradigm. I like that the team guiding this venture** is comprised of an editorial director with the right chops (Gary Hoenig, founding editor of ESPN The Magazine) and creative and business executives who “get” how storytelling engages people across digital platforms. I like that the team doesn’t have all the answers yet; they are taking a “test and see” approach, which is essential in digital media. Sports and news are the digital content powerhouses — the only two — that generate serious traffic and engagement at scale. Because they are happening NOW. If this venture helps demonstrate that the public’s appetite for quality content of substance trumps sensationalist stories and “click-bait,” it will be a triumph — a move in the right direction for humanity. It is a great experiment. Can’t wait to see how it shapes up. *In September, Jeter released his first children’s book under Jeter Publishing, an imprint of Simon & Schuster. The Players’ Tribune launched with a single story on domestic violence, which shows the gravitas of the site’s projected content. – Jaymee Messler, the CMO of Excel Sports Management, which manages Jeter, Tiger Woods and a host of other top athletes. – Gary Hoenig, the founding editor of ESPN The Magazine is editorial director of The Player’s Tribune. – Mark Grande, a former agency VP who heads content and business development. – Jason Marks (executive creative director) and Matt Dowshen (managing director) of Partners+Napier, a creative agency. Update, Oct. 3: Points made in this story and quotes appeared in this Fox News story exploring the impact of The Players’ Tribune. While I did acknowledge the writer’s posit that there could be rights issues between team sponsors and individual player sponsors, I said that the players respect the teams and leagues and likely will “fish in another pond” to avoid sponsor conflicts. Posted in Digital Strategy, Newsworthy and tagged agencies, content marketing, engagement, news, sports media.